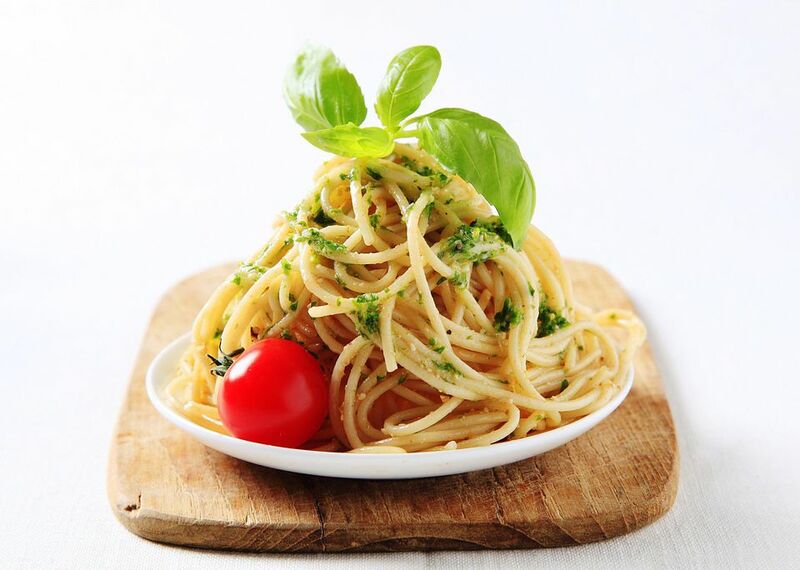 Tomato Pesto Spaghetti is a fabulous recipe. Use large tomatoes only when tomatoes are fresh and impeccably ripe in the summer. During the spring, fall, and winter, make it using cherry tomatoes, which are reliably sweet, tender, and delicious. You can also make your own Pesto and use about a cup of it in this recipe. I like to sprinkle this with some Parmesan cheese - but that makes it a four ingredient recipe! You can certainly add more ingredients to this recipe if you'd like. I like to add baby peas or some cooked onions and garlic. Any leftover cooked vegetable would be delicious in this easy recipe. Serve it with some toasted garlic bread and a green salad or a fruit salad tossed with a sweet vinaigrette. A glass of white wine completes this easy meal. Bring a large pot of salted water to a boil over high heat. Cook the spaghetti according to the package directions until it is al dente, or just tender with some texture to it. Drain the spaghetti well, first reserving 1/4 cup of the cooking liquid. Return the cooked and drained pasta to the pot along with the reserved cooking liquid. Stir in the pesto and toss with tongs over low heat until the spaghetti is evenly coated. Add the tomatoes at the last minute, toss gently, and serve immediately.